Home > Health > 5 Most Successful Rehab Programs in the U.S.
5 Most Successful Rehab Programs in the U.S.
With more than 14,500 addiction rehabilitation centers in the U.S. alone, how do you narrow down the field to find the most successful rehab programs for you or your loved one? Every facility offers a different therapeutic and clinical approach and varying programs, services and accommodations. Here, we’ll give you some pointers to find the best drug and alcohol rehab program for your individual needs. There is no one-size-fits-all approach to alcohol and drug addiction treatment, but the most successful rehab programs have several principal characteristics in common. Be sure to look for the following credentials and services in any program you’re considering. Co-occurring behavioral health disorder services: A vast majority of people suffering from addiction have comorbid disorders such as depression, anxiety, bipolar disorder, trauma or PTSD. Treating these conditions at the same time is crucial. Specialized programs for varying demographics, including teens, young adults, men, women, seniors, LGBTQ, etc. We’ve done some of the initial research to help you find the best drug rehab centers and top-rated alcohol rehab centers in the U.S. The following treatment centers are just a handful of many highly-rated centers. Caron Foundation provides alcohol and drug treatment to teens and adults. Its central residential facility is on 110-acres in Wernersville, Pennsylvania. They also have a smaller residential program in Boca Raton, Florida, as well an outpatient program in Atlanta. Caron Treatment Center has been providing substance abuse, mental health and recovery treatment since 1957. Caron is known for its gender- and age-specific, individualized approach to care. They follow the 12-step principles and incorporate a spiritual element and family therapy into their treatment plans. And clients who require medical care and monitoring can begin treatment in the center’s 24-hour on-site detox unit. The Hazelden Betty Ford Foundation has 14 drug and alcohol treatment centers around the U.S. Five offer inpatient care, while the remaining provide outpatient treatment. Hazelden was founded in 1949 at a Minnesota lakeside farmhouse and grew into one of the best drug rehab centers in the world. They merged with the Betty Ford Center, one of the top-rated alcohol rehab centers, in 2014. Hazelden centers combine evidence-based practices with recent research and the 12-Step principles to create an individualized plan for both inpatient and outpatient treatment. They integrate a holistic approach to health and well being in addition to mental health services and individual, group and family therapy. Locations: 14 centers around the U.S.
Sober College is a unique substance abuse treatment center focused solely on young adults from 18-26 years old. The facilities are structured like a college campus and include family-style housing, an occupational center, an academic center, various sports and recreational areas and much more. Founded in 2006, Sober College partnered with Woodbury University in 2011 to become the only treatment center that offers on-site accredited college courses. They provide one of the most successful drug rehab programs for this targeted age group. Sober College’s treatment model is structured around Five Core Competencies: sobriety, emotional growth, life skills training, productivity and fitness. Each client gets an individualized treatment team made up of substance abuse and mental health counselors, an academic coach, a fitness coach and more. Addiction Solutions, formerly called Solutions Recovery Center, boasts one of the most successful alcohol rehab programs in the U.S. This luxury facility, founded by a recovering alcoholic of 29 years, is a small, family-style rehab that’s not at all institutional in nature. Addiction Solutions offers its opt-in Break Free Plan™, in which every client has a primary therapist, a primary counselor and additional addiction specialists available around the clock. Once treatment ends, a Solutions facilitator accompanies the client home to help with the reintegration process. Origins Behavioral Healthcare has been offering a holistic approach to drug and alcohol treatment for more than 35 years. Its resort-style campus in South Padre Island provides on-site detox and gender-specific residential treatment. The Hanley Center in Florida is a pioneer in age-specific treatment for Older Adults and Baby Boomers. Origins fuses contemporary addiction medicine and clinical sciences with an immersion in the 12-Step experience. They place a heavy emphasis on family involvement in the recovery process. Clients also have access to nutritional guidance, outdoor adventure therapy, fitness plans and other whole-body healing experiences. Origins’ famed PsychoNeuroPlasticity Center uses leading-edge research on the brain’s capacity to restructure and renew itself to find solutions to such neurological and psychological conditions as ADD/ADHD, PTSD, mood disorders, bipolar disorder, obsessive compulsive disorder and more. What Are Drug Rehab Statistical Success Rates? Unfortunately, there’s no standard way to measure success rates and no reliable average success rate of drug rehabilitation. 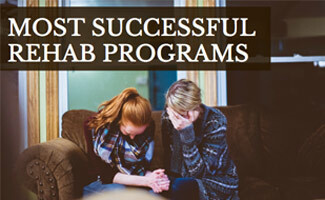 Some centers base their success rates on program completion while others base them on sobriety immediately following treatment. These are far from reliable metrics. That doesn’t mean that centers don’t tout their “success rates.” Some facilities boast of 90% success rates, for example, but this number is often misleading. What criteria are these rates based on? How long after treatment are we talking about? Many facilities don’t keep statistics on long-term recovery and may not know of subsequent relapses. The average relapse rates for drug and alcohol addiction fall anywhere from 40% to 60%. According to the National Institute of Drug Abuse, however, rehab statistics relapse rates rival relapse rates for other major chronic diseases, such as diabetes, hypertension and asthma. Why? All of these conditions require long-term, consistent care. The nonprofit organization, New Beginnings Drug Rehab, is an excellent source to help you find the best addiction rehabilitation centers and other support you might need. Their website has extensive information about all kinds of addictions, different types of recovery centers and more. And they have representatives who will assist you in your search. It can also help to have some techniques on hand to communicate with your family member or friend who’s addicted to alcohol or drugs. Check out the video below for some helpful advice from an addiction psychologist. Could Addictive Personality Disorder be the Culprit? Addiction to alcohol and drugs stems from many causes, one of which could be a personality disorder. Learn more about how to spot the signs of addictive personality disorder, which can contribute to addictions to drugs, gambling, shopping, work, exercise and more. We give you tips on how to identify, treat, and help yourself or your loved one suffering from an addictive personality disorder. What experiences have you had with alcohol or drug addiction treatment programs?